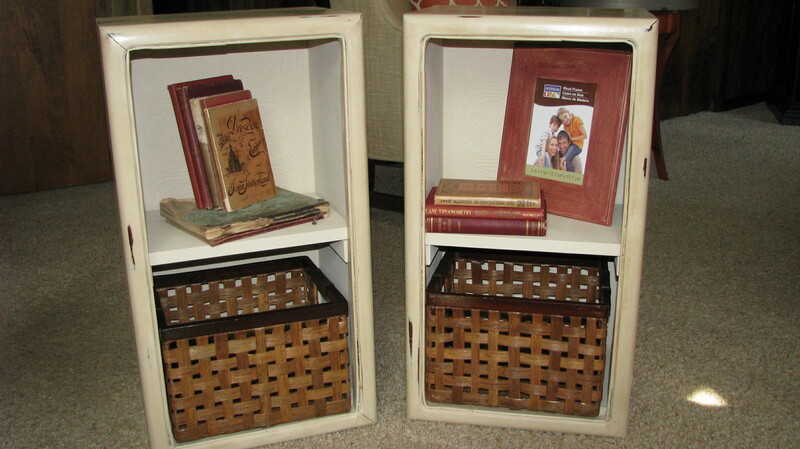 When these pieces became available, I loved the style for our guest bedroom which our granddaughter uses often. I chose the Paris Gray/Pure White ASCP combination because it is so fresh looking. (Also, I had leftover Paris Gray from our master bathroom re-do.) In less than a week, we had a sweet new bedroom set. I love ASCP because I could paint the white, and while it dried, paint the gray. Gave the pulls a fresh coat of white paint too. 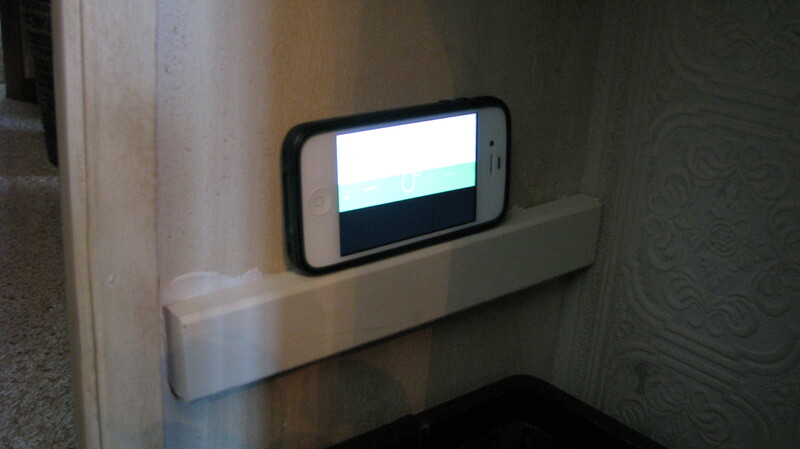 There was one broken pull to replace, so I put it on the dresser with a stand alone fancy drawer. Originally, the tall chest of drawers had 4 fancy and 2 plain drawer fronts. So I swapped out a fancy for a plain on the dresser to give it some interest. Also let our granddaughter help paint the pulls. She loves to help! Here are the other pieces. I forgot to get a full shot of the mirror but the bottom of it is showing in the dresser picture. I finally got around to painting our Master Bath vanity this week – thank you, Spring Break. I will post on the full makeover soon, but wanted to share this little tip on my shelf paper alternative. 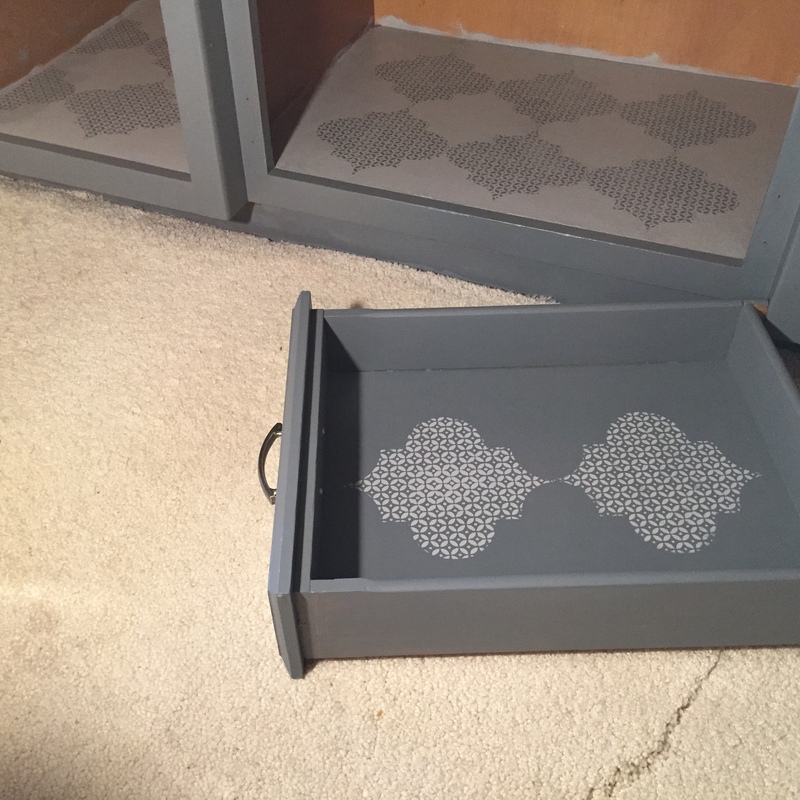 We recently painted the bedroom gray and cream and I wanted to give the vanity a facelift too. Paint, new hardware. I used Annie Sloan, mixing Graphite and Paris Gray 1:1. Loved the color and wanted to wrap it up with some pretty shelf paper before replacing the cabinet contents. But sadly could not find any paper in a gray pattern. In fact, I don’t think they’ve made new shelf paper since 1970. So, I decided to try my hand at stenciling. Hey, if I mess up, no one really sees the inside of the cabinet but us, right? I used Paris Gray along with the new vanity color. Finished it off with two coats of lacquer to protect it from toothpaste, lotions, oil spills and water. I learned less paint on the brush makes a neater stencil. Stay tuned for the complete makeover. I am so happy to finally have a bed and headboard in our guest room. 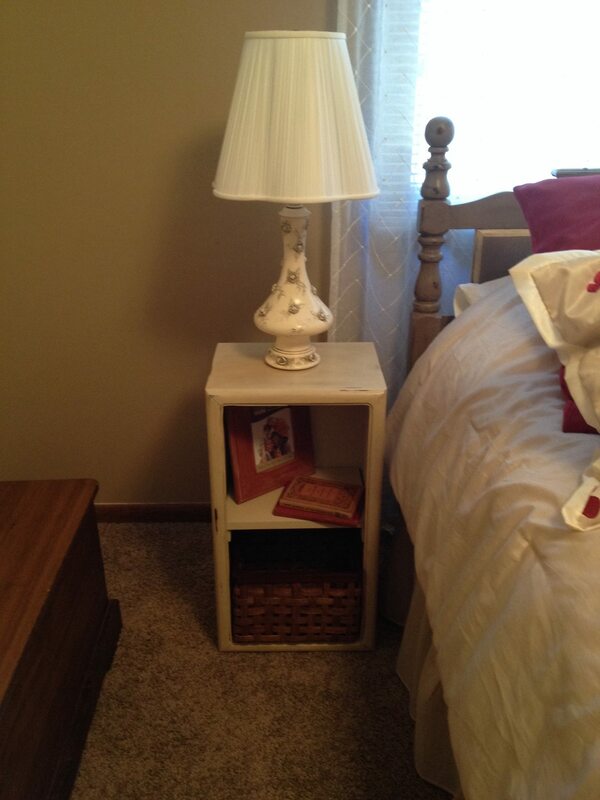 Of course no guest room is complete without a nightstand for a bedside lamp and to lay a cell phone/alarm clock, right? 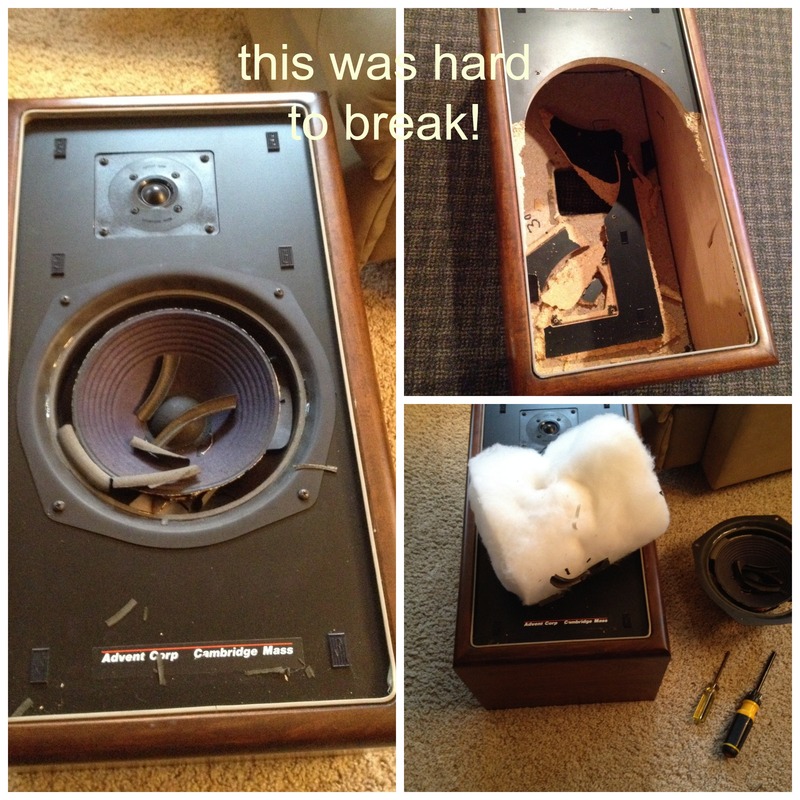 It so happens that we had this set of old Advent speakers laying around that I rescued from garbage pickup in hopes of upcycling them. So I began the simple process of taking them apart. Wow, it took more muscle power than I expected! This left some rough edges on the inside so I needed to get creative. What was flexible, paintable and easy to attach to the inside curves? 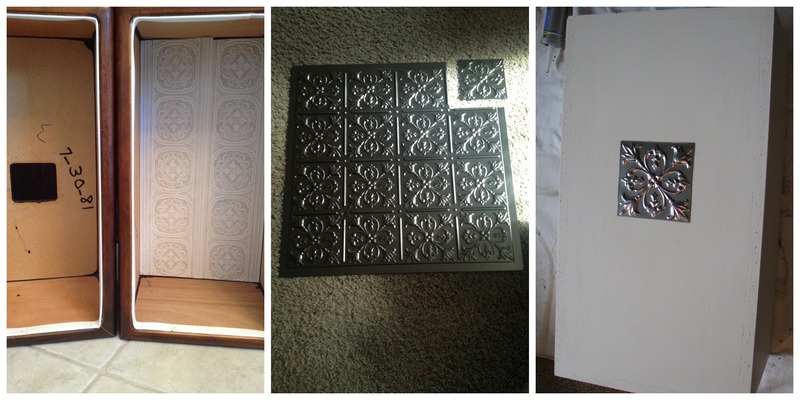 I found some vinyl ceiling tile trim (2 for $8) that I could bend and attach with liquid nails and some finishing nails. 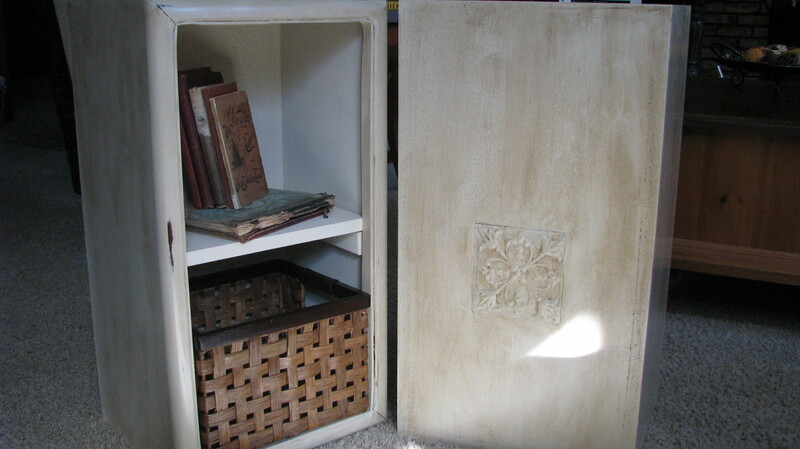 Since I was using Annie Sloan Chalk Paint, I knew it would stick to the vinyl. The speaker had a hole in the back so for the inside, I used paintable wallpaper border on the back panel. That wouldn’t be strong enough to cover the outside though. Again, more head-scratching and wondering what to use…. I was looking for a tin square to attach but couldn’t find any sold separately. 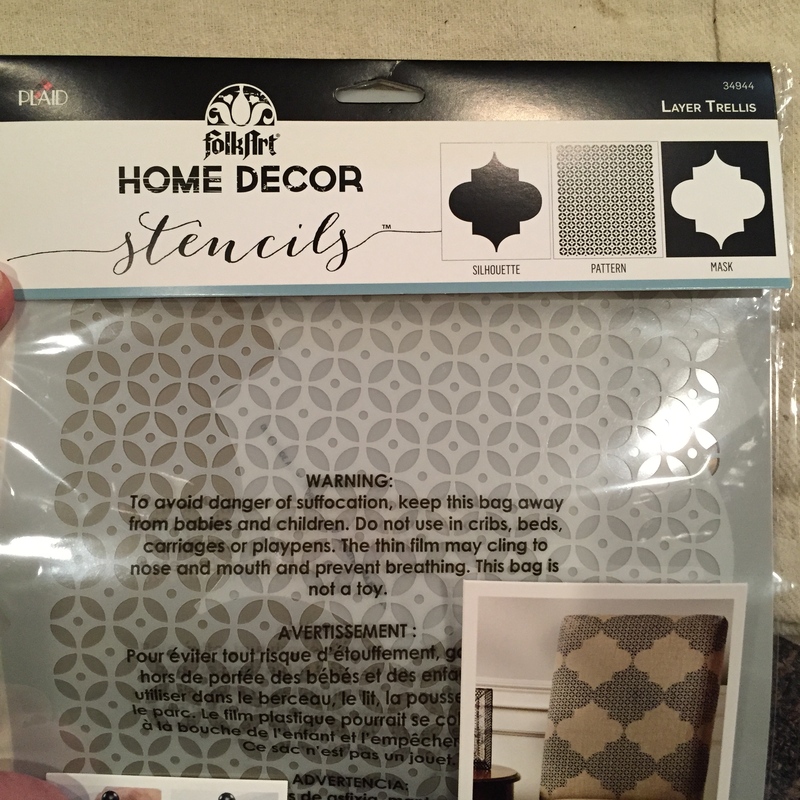 So, found this faux-tin (vinyl) ceiling sample online at Home Depot for under $5 which they shipped for free to the store. I only needed 2 squares, so I have most of the sheet left. Since we don’t have a level small enough to fit inside the speaker to ensure level shelves, I used the compass app on my iPhone. Open the app, swipe left and there’s a level! 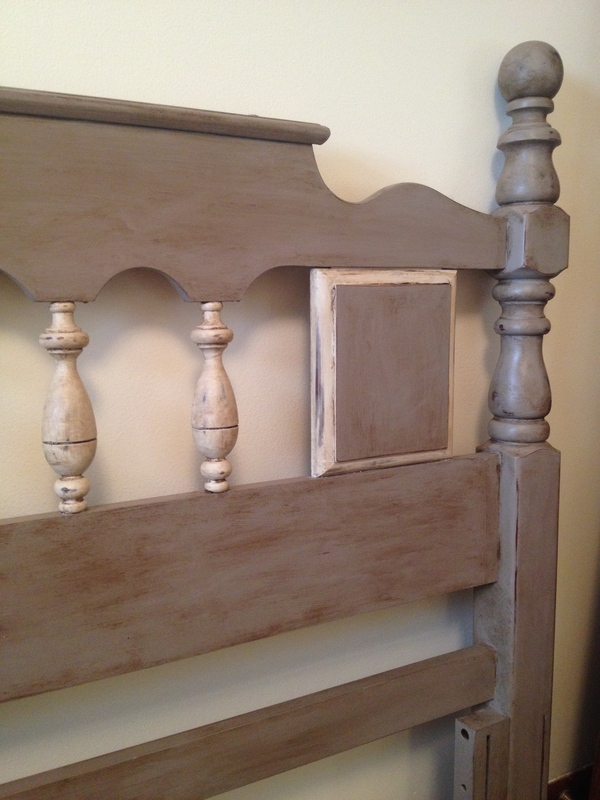 I used the same Old Ochre Annie Sloan paint that was on the headboard spindles. Scuffed up the edges a bit, then added some Annie Sloan dark wax to finish! And done! 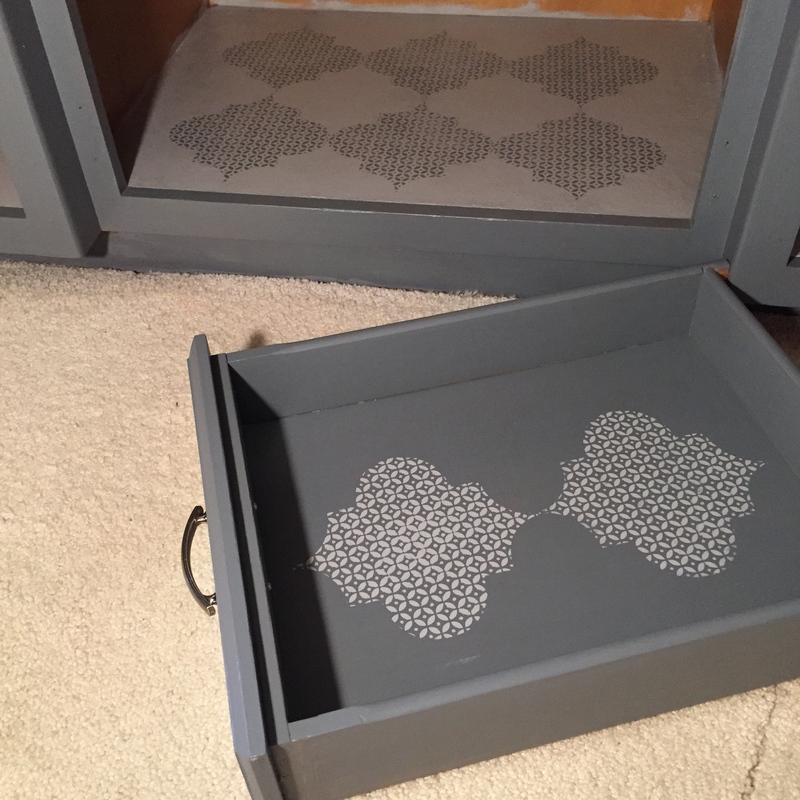 Two projects done, so maybe not a Chalk Paint newbie anymore? My mom passed away in July and we siblings are just now going through and choosing what we want to remember her with. I picked her sweet little lamp with roses on it. She used it all the time and had it as far back as I can remember. What a perfect complement to the nightstand. 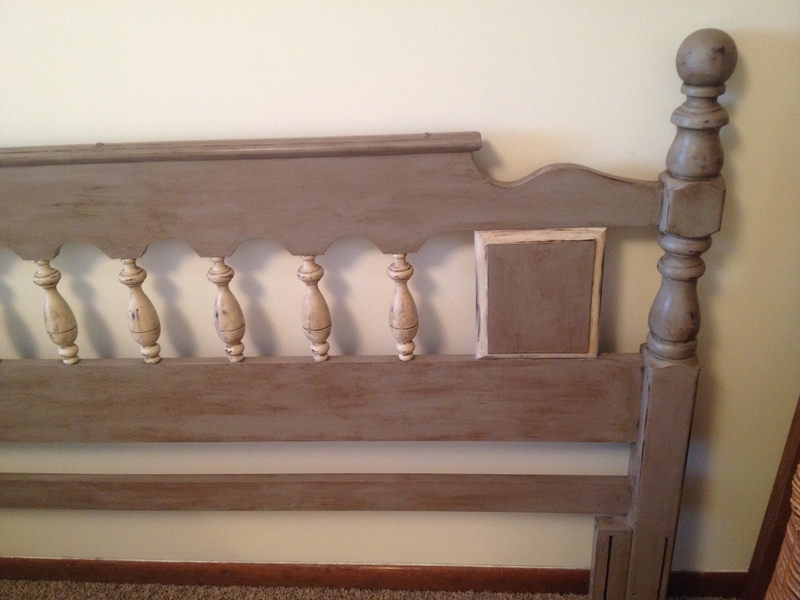 Here’s the post where I did the headboard. Not sure yet what my next project will be. Maybe the cabinet in our master bathroom. Or the old teacher’s desk in our office…. Please stop back and see what’s next!! We have a guest room that finally has an actual queen-sized bed. The air mattress, rest its soul, never made it past six months. I wanted a headboard now, but the new ones I shopped for were blah or pricey. I happened upon a new store, Sandpaper, that sells Annie Sloan chalk paint. Loved what I saw in the store and asked lots of questions. Next thing was to find a used headboard to refinish. 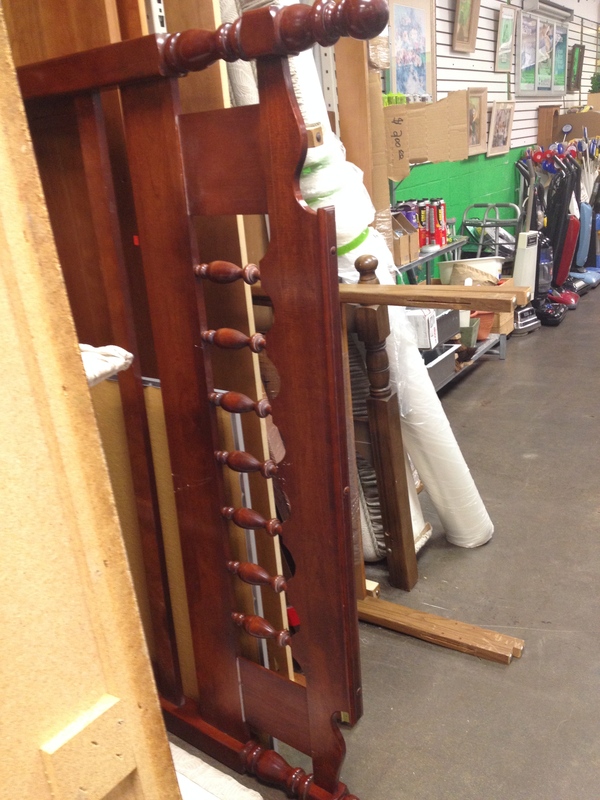 Went to a few salvage spots and finally found a great piece at ReStore where money raised supports Habitat for Humanity. The $30 price tag was cut in half for a Labor Day special so I walked away with this headboard in great condition for only $15! FYI, a full-sized headboard is smaller than a queen-sized one. Bring your measuring tape to salvage markets. I took a chalk painting workshop, and boldly left the store with cans of Coco, Old Ochre, clear wax and a new brush in hand. I made trips back for dark wax and a second brush.